Last in the series on Itsumo Ahi Tuna Jerky is this Spicy variety. See last week's review of their Sweet variety. 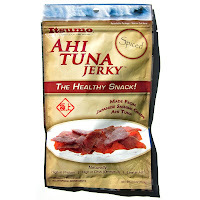 Itsumo Ahi Tuna Jerky is a new product that launched last month at the National Association of Convenience Stores expo. The name Itsumo is a brand name, owned by DML Venture Enterprises. DML is a partner company of Pesca Rich Manufacturing. The two companies combined capture, process and distribute sashimi grade tuna to grocery stores and restaurants all over the world. This new jerky snack expands upon the Itsumo brand. 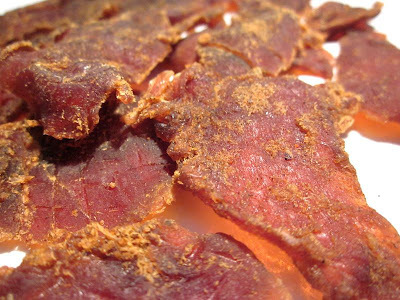 The tuna used in this jerky is all hand caught by line, and is claimed to be dolphin safe. As they process the tuna into sashimi, the left over pieces are used to make jerky. Yellowfin tuna (wild caught), soy sauce, corn syrup, ginger, black pepper, garlic, red pepper, salt, sorbitol, alcohol, onion powder, nutmeg, glutamic acid, smoke oil, sodium erythorbate. The first thing I taste from the surface of these pieces is a moderate sweetness, but quickly taken over by a significant saltiness. A fair amount of spiciness, more like black pepper, builds moments later. The chewing flavor starts with an increased saltiness, while the black pepper flavor becomes more defined. The natural meat flavors of raw tuna become quite strong, along with a light touch of soy sauce. For being labeled as "Spicy", this seems to hold up well. I do get a good deal of spiciness, mostly as a black pepper flavor, along with a clear black pepper aftertaste in the back of my mouth. There's a light bit of heat building, but not that strong. I'd rank it as a mild-medium (level 2 out of 5) on my personal heat scale. Otherwise, this jerky tastes just like the company's Sweet variety I reviewed last week. It has the same light bit of initial sweet that's quickly erased by a significant saltiness, as well as a dominant ahi tuna sashimi flavor. The only difference is that the dusting of black pepper on the surface of these pieces give it more seasoning, and seems to cover up much of the "fishiness" in the meat. As a result, this Spicy variety actually ends up gaining a bit more snackability. I'm getting a cleaner ahi tuna flavor, that is, with less fishiness, and more of the sashimi flavor. I also think the increased black pepper flavor makes this more enjoyable. The level of saltiness in this feels to be at a medium to high level, despite the nutrition facts label showing a moderate sodium content. Overall, what you're going to taste in this is the natural meat flavor of ahi tuna, more comparable to sashimi, with some soy sauce flavoring, a significant black pepper flavor, a light touch of seasonings, and a significant saltiness. These are slices of whole meat, sliced to a medium thickness, and in bite-sized pieces. This is a dry jerky with dry surface feel. They have a bit of flexibility and are able to bend about 90 degrees before cracking open. It's slightly more soft and easier to chew than the company's Sweet variety. The chewing texture starts out feeling just like a piece of beef jerky, more comparable to a Jack Link's. They have some initial chewing resistance, and take a a bit of effort to chew down to a soft mass. At that point, it has a texture somewhat like tuna sashimi, but more chewy and dry. 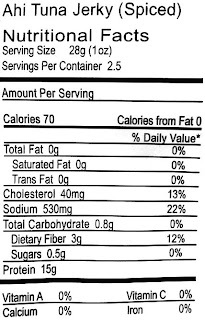 There doesn't appear to be any fat, skin, bones, or other tissues found in this jerky. It seems to be pure meat. In terms of clean eating, it's very clean. No residue on my fingers and no pieces of meat or other flying off as I eat. 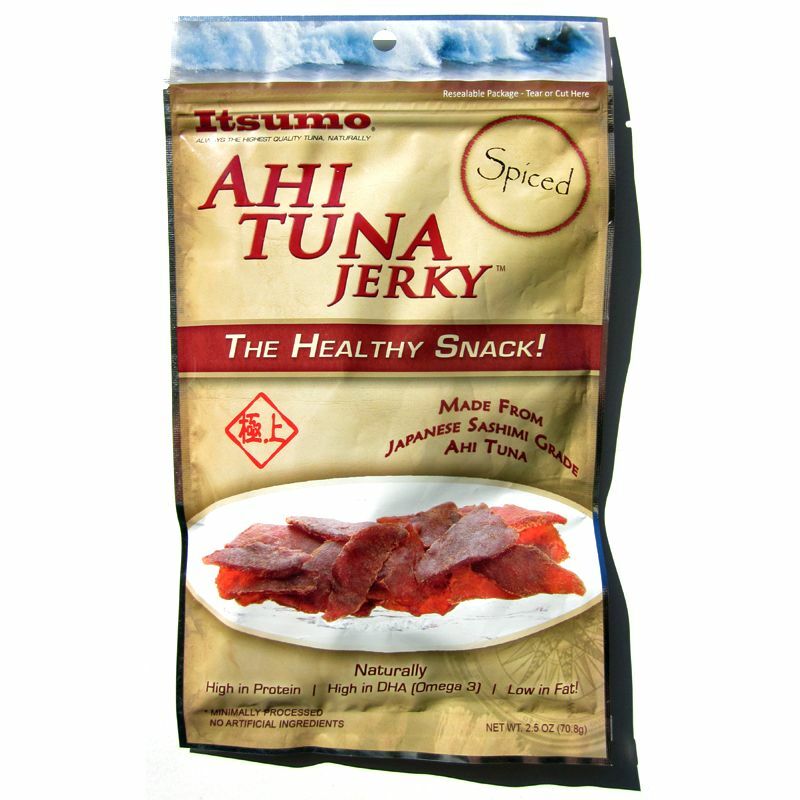 Itsumo sells this Spicy Ahi Tuna Jerky from its website at a price of $6.99 for a 2.5oz package. If you bought six packages, along with a flat-rate shipping of $6.00, the total comes to $47.94. That works out to a price of $3.20 per ounce. 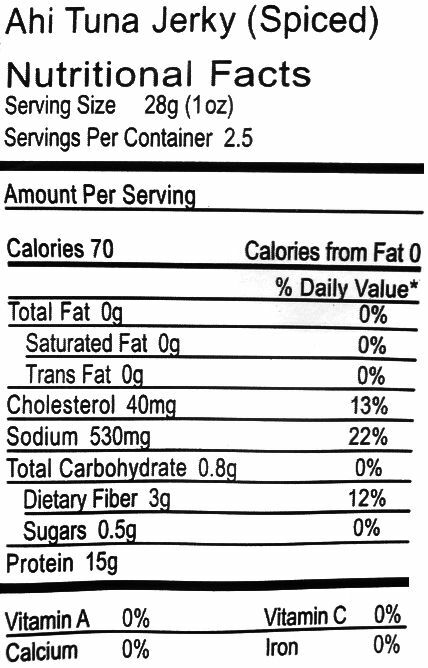 For general jerky snacking purposes, at the $3.20 per ounce price, it's a weak value. I do get a fair amount of snackability in this for an overall satisfactory flavor, good meat consistency and decent chewing texture. It's just that the price is quite high for general jerky snacking compared to other jerky brands you find at your local grocery store, yet provides a similar snackability. As a Spicy Ahi Tuna Jerky, it's a fair value. I do get a well-noticed spiciness, and a light bit of heat, and I also pick up a natural meat flavor very much like a piece of tuna sashimi. However, the price is still double the price of the only other Ahi Tuna jerky brand I reviewed, that from Alien Fresh Jerky, which seems to have a little better flavor. 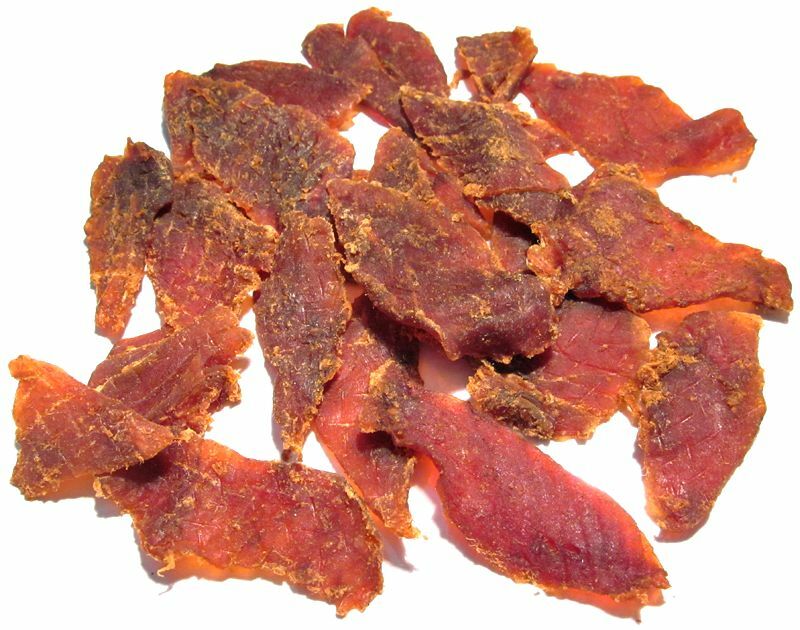 This Spicy Ahi Tuna Jerky from Itsumo delivers a good deal of spicy flavor, mostly through a dusting of black pepper which seems to add a light bit of heat. It also manages to provide a flavor that resembles eating a slice of tuna sashimi (raw fish filet), dipped in some soy sauce, and seasoned with some light spices. Compared to Itsumo's Sweet Ahi Tuna Jerky, this Spicy variety clearly has the better flavor in my opinion, for one because the extra black pepper gives it nice spicy bite to balance out the soy sauce and light sweetness, but also because it softens the fishy flavor I found in the Sweet variety. As a result, I taste a more fresh tuna sashimi flavor, which improves upon the snackability. But is that enough to push it above average? It just didn't seem so to me. I'm still not finding the flavor of tuna sashimi to be as snackable as smoked tuna when presented in the form of jerky. I can certainly slurp down sashimi at my local sushi bar all night long, but as jerky it just doesn't turn on any light bulbs. My recommended beer pairing for this, I'd go with a red ale, try the Karl Strauss Red Trolley, or the Lagunitas Censored Rich Copper.